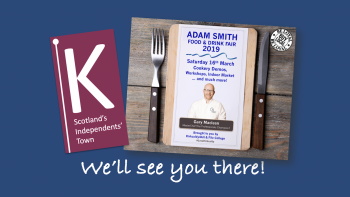 Scotland is home to hundreds of outstanding producers, suppliers, restaurants and foodie entrepreneurs, and on 16th March 2019 they’re sharing their culinary skills and ideas with the public at Kirkcaldy’s annual Adam Smith Food & Drink Fair. The FREE event takes place in the Atrium at Fife College’s St. Brycedale Campus and features chef demonstrations, food and drink stalls and kids’ cooking workshops. 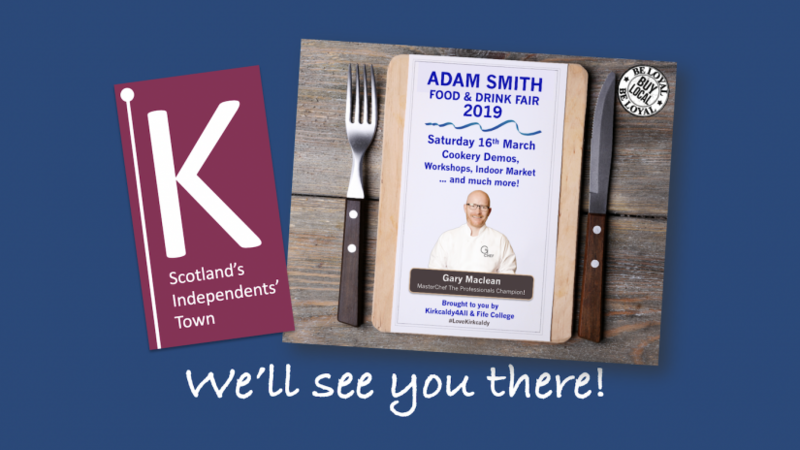 Brought to the town by Kirkcaldy4All and Fife College, the event is headlined by BBC’s MasterChef The Professionals 2016 winner, Gary Maclean – Scotland’s National Chef. 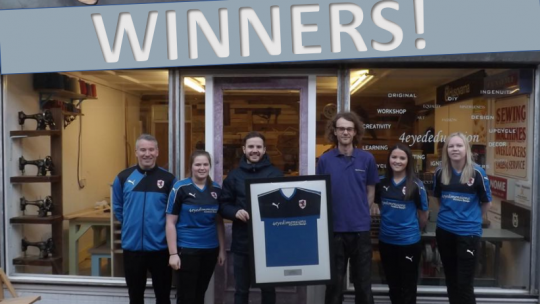 There will also be a vegan cookery demonstration by Chef Tom Pratt from The Waterfront Restaurant in Kirkcaldy as well as a demonstration by Fife College’s award-winning students. And at four ‘hands-on’ workshops, children can have fun decorating cupcakes or make healthy pizzas. There’s ample opportunity for feasting and shopping on the day with over twenty-five local food and drink producers at the indoor ‘market’, showcasing and selling their wares – ranging from jams, dates, cupcakes and chocolates to burgers, sushi, olives, coffee, bread and cheese, as well as whisky, gin and cocktails. For those looking for healthy options, all three of Kirkcaldy’s vegan/vegetarian restaurants and cafés are represented – The Bakers Field Cafe, VeganShi and Kangus Coffee House. Want to join a Kids’ Workshop? Booking essential! All workshops are FREE – and are limited to 16 children per session – with a limit of a maximum of 2 workshops per child. PLEASE NOTE – ALL THE WORKSHOPS ARE NOW FULLY BOOKED! We will be posting and sharing more updates on this Blog as the timer ticks towards the event – and sharing on Facebook, Instagram & Twitter. We’re delighted that the continued success of our event means we are now oversubscribed with companies supporting us with stalls, displays and tasting stations; as a result, there’s now a waiting list. 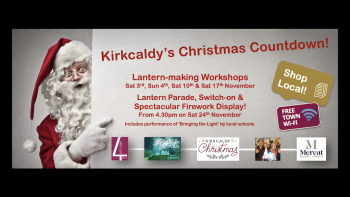 If you’d like your details added – for this or for future events in the town – please email laura@kirkcaldy4all.co.uk and share information on your company, your produce – together with your contact details. Chef Lecturer Gary grew up Glasgow. His inspiration to become a chef is founded in his love for cooking even from a very young age – home economics was his favourite subject at school. During his early career, he worked in Glasgow’s finest hotels, learning essential techniques including butchery and preparation of game – skills he uses to this day. He’s worked alongside some of the country’s top chefs. Married to Sharon for 25 years (they met as students in the same class at college), they have five children and live in the North Glasgow suburb of Robroyston. He has been teaching part time and full time at the City of Glasgow College for over 17 years – passing on his experience and knowledge to the next generation of Scottish master chefs! Gary has won many national and international competitions including numerous personal awards – the highlight being The Craft Guild of Chefs lecturer of the year for the UK in 2015.